The training is easy to understand and the stuff which John and Daniel teach are actionable. In fact, in a week`s time, I created a website on bookographics (which is what you`re looking at right now), opened an account on Pinterest, and created and pinned more than 10 bookographics. To be honest, I have watched a lot of webinars on various subjects, bought a few courses but this is the only one which I took action right away. Support is great! There is a Real Fast Pinterest Facebook group and John and Daniel are active in the group. If I have a question, all I have to do is ask and I`m sure to get an answer. I also like the group`s dynamics. The training content is something I haven`t seen before. It focuses on the actual images/graphics that could amp up your marketing results. John gave an example of a bookographic which has had 1.4 million repins in just the last 18 months. This same bookographic drove over 123,000 visitors to one of his websites. I think authors would benefit a lot from this training. While the training shows how to promote a book and drive traffic to any site using Pinterest, the bonuses complement this by teaching how to do the same using Facebook, LinkedIn and Twitter. The bonuses also include a complete training all by itself – the Real Fast Book Marketing Training – which shows how to sell 100-200 books in two weeks or less. 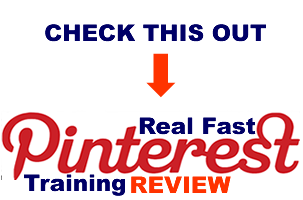 For more information about the course, go watch the Real Fast Pinterest free webinar. You can also download a free 37 page report which I find very informative. Even if you don`t buy the training course, you will learn a lot from this free webinar.